Cabinet 6 on Painshawfield Road (opposite Snowdrop Cottage) went live today. Cabinet 2 - Meadowfield Rd: still looking at into next year before this one goes live. I got the following information from iNorthumberland today. Cabinet 2 is a bit further off - probably into 2015. I’m on Cabinet 5, so in the interests of journalism (!) I’ve just ordered a superfast service. (Remember, you can find out which cabinet you're connected to by visiting BT's broadband checker site.) You can buy your service from a number of providers but I guess that many people are with BT and may wish to stay with them. As I've been with Plusnet for a while I thought I'd go with their service. The maximum speed available on my cabinet is a whopping 80 Mb per second! However, I went with Plusnet's cheaper 40 Mb service to begin, with a view to upgrading in the future if I think I need the extra speed. Here's what you need to know. Because this is a new technology, it is incompatible with standard ADSL broadband. So, I will soon be receiving a visit from a BT technician (as BT still handle the wires) who will replace my current master phone socket with a new fibre compatible one. The technician will also install a fibre broadband modem on that socket. All of this is free of charge. Next, Plusnet are sending me a new router as my current ADSL router is not compatible. This new router is also free (though they are charging me six quid for postage). I see from BT's web site that they will supply a free Home Hub 5 for use with their fibre service. New Ridley: Decision on False Premises? Recently I posted some thoughts on the council's complete reversal in its thinking when it chose to approve the planning application for the development at New Ridley. One of the reasons for the decision that I picked up was that the county is concerned that 80% of planning decisions are overturned on appeal. However, a quick look at the Planning Inspectorate's own figures (see page 77) reveals almost the exact opposite to be true: for the Northumberland County Council planning authority in 2013-14 68% of appeals were dismissed. Was the decision made on a misunderstanding of the facts? So, there is something of a storm brewing at the moment over the Northumberland County Council's (NCC) decision to axe free travel to post-16 students from this September. This comes in just at the time that the law is changing to make it compulsory for children to stay on at school until the age of 18. Just as we approach the end of the period in which we thought we were going to get super fast broadband, there has been another delay, and we're now looking at some time in August before the service goes live. If you were inconvenienced by the temporary traffic lights along the A695 today, it may lessen the annoyance to know it was all in the good cause of super fast broadband. 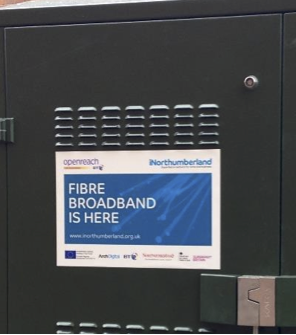 Today Openreach (the BT company that installs and maintains the infrastructure) were at the new cabinets along the A695 installing the main fibre optic cable that will link them to the main network. The deadline for comments is 8 April, and I encourage anyone with an interest in this case to make representations. Mike Easey kindly downloaded all 30+ documents relating to the appeal from the NCC web site (see http://publicaccess.northumberland.gov.uk/online-applications/caseDetails.do?action=dispatch&keyVal=MDFAMHQS2L000&caseType=Application). These have all been assembled into a single PDF file which you can download here. Note, it's a 54MB file, so until we get our superfast broadband it could take a little while to download. In my last update I talked about cabinets and BT's rollout plans. There have been some recent developments that merit a further update. You may have noticed new green boxes sprouting up on pavements around the village. These are the cabinets that will provide the new superfast broadband. Three have appeared on the A695: one outside Boots, one opposite the entrance to Cade Hill Road, and one down by the railway station. Here are a couple of pictures of the new one at Branch End outside Boots. It's not terribly pretty, and I'm not sure why it has been placed so far from the wall, but at least it will be giving us faster broadband! In the original rollout plans the Stocksfield exchange was scheduled for the fibre optic broadband upgrade in late 2014. 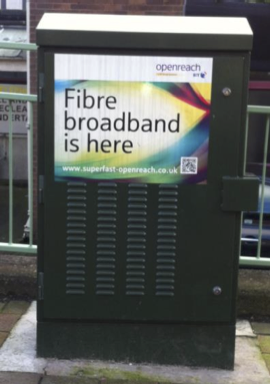 Some recent scheduling changes mean that Stocksfield has now been brought forward a quarter and some householders could be benefiting from a superfast connection very soon, several months earlier than originally anticipated. Details on which cabinets will go live and in what order will be provided nearer the time, but I am working with iNorthumberland to organise a publicity event to take place in April to let residents find out full details of what will be available and when. I am very dismayed by today's announcement that Northumberland County Council have decided to make the recently appointed director at Arch, responsible for broadband rollout, redundant- just as all the key work needs to be done to reach the 90% of premises included in the first rollout, and then work on some clever planning for the last 10% presently not planned for. Perhaps the Labour administration's focus on making these bad budget cut decisions (which will have longterm negative impact on the future economic development of rural Northumberland), explains why no-one from County Hall was lobbying Westminster to ask for a fair proportion of the next £250 million announced today. Due to Labour councillors' lack of interest in the economic future of rural Northumberland, we have only been allocated £650,000- against North Yorkshire's £10million or Durham's £3.8 million. When will our elected representatives start fighting our corner? I have written to the Secretary of State, Maria Miller MP, at DCMS today to try to find out why we have had such a poor commitment, & what we can do to access more funding, since we have one of the hardest to reach areas left to get broadband to in Northumberland. Funds should flow to these areas rather than to those easy-to-fulfil (& probably economic for BT anyway) through expected growth. Rural Northumberland deserves a better deal & a fair share of resources from local & central Government. On 17th July last year we celebrated the rejection of the planning application in New Ridley. The deadline for the developers to appeal was this month and it seems that Esh have, indeed, submitted an appeal against the planning decision.